We are excited to announce that we have a new and improved website! Our new site incorporates a new look, easy to use navigation, and an enhanced customer experience. Our new responsive design gives our site a fresh clean look, is mobile-friendly, and features a modern, clutter-free appearance. Scroll down its one-page design and you have easy access to our best-selling WiFi products. You can view our website on your computer, tablet, and phone. We’ve also updated our logo to complement our website. Our new tagline – “Be Save, Stay Connected” – exemplifies our company mission and commitment to our customers, helping to provide peace of mind while you are traveling. We’ve organized our site to be more intuitive, making it easier to get to the products that interest you. With one touch, you can quickly get information on our WiFi products. And with our simplified order process, you can quickly place your order for the products that best fit your needs – all from our secure shopping cart. For our customers, you can now access your account when it is convenient for you and wherever you are. No matter what country you are in, you can add airtime to cell phones or SIM cards, add data to your pocket WiFi device, or check your account balances. 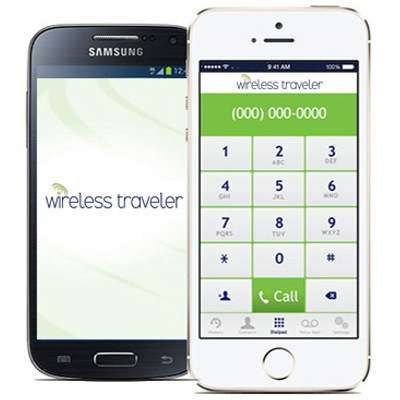 Interested in our Wireless Traveler WiFi Calling App? You can quickly download the app and set up your account with our simple 3-step account activation process. For our Travel Advisors, you can access our special offers, request customized PDF flyers for your customers and groups, and see tips on gifting ideas, e.g., offering the WiFi Calling App or Pocket WiFi as gifts to your clients. Click on Agent Login to login, or if you aren’t registered yet, simply complete the registration form. With the launch of our new site, we are pleased that our blog is now fully integrated – you can find it here. You’ll continue to find great articles on WiFi trends and products, travel destinations, travel tips, and much more. Our look may be different, but our commitment to our customers remains the same. Please feel free to give us a call or send us an email with any questions you might have.